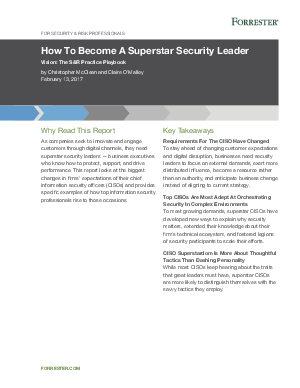 As companies seek to innovate and engage customers through digital channels, they need superstar security leaders — business executives who know how to protect, support, and drive performance. This Forrester report looks at the biggest changes in firms’ expectations of their chief information security officers (CiSOs) and provides specific examples of how top information security professionals rise to those occasions. Download this Forrester report now and secure your future.